Our newest Micro-Monitor M-5.1 was developed over a two-year+ period during 2006-2008. The first inspiration for this model came to the designer, Ray Indris, about 1973. However, variations of this model were built and sold over the decades, but never coming to full fruition until The Quanta Technologies Micro-Monitor M-5.1. What makes this model so unique is five decades of design work coming together as never before for this designer. Three major parameters must be reached in order to achieve the desired goals. We desired a neutral sound with a smooth flat frequency response. Well that in itself is a lofty goal and many companies achieve only that. We wanted more than that, that’s why it took over two and a half years in overall development. Thank you so much for the incredible Home Theater System that you and David designed and installed recently in my home. The system is a dream come true. Having been an audiophile since the early 60s, I was pleasantly surprised how well your custom-built Quanta Technologies MicroMonitor M-5.1 model and the Super Subwoofers performed when driven by the finest “state-of-the-art” audio equipment. The sound they reproduce is crisp, clean and extremely dynamic, from the highest highs to the lowest lows. The subs reproduce the tightest, cleanest, deepest, and best defined low bass that I have ever heard. I had not thought this level of clarity was even possible until hearing these setup properly in my home. 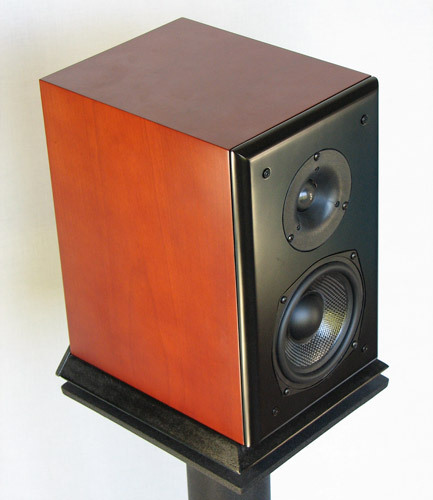 Your custom-built Quanta Technologies speakers are much more linear and real sounding than any I have ever heard from any of the best big name manufactures. The time consuming rigorous testing and tweaking that you did to all six speakers have created a sound that is truly an awe inspiring experience to all those listeners who have heard the system. I was impressed with each of your two 180 pound superbly designed and built Quanta Technologies subwoofers utilizing two 15” woofers in a special composite push-pull design with two very large flared ports. Your choice of [six] Parasound HALO JC 1 class-A monoblock power amplifiers proves the point that super-clean high power (1200 wpc into 2 ohms) can in fact produce extremely tight well-defined bass down into the low 20s. They produce bass notes so low, with such effortless energy and authority, that the whole house shakes as if in an earthquake. Thank you for including the Audyssey computer-driven EQ in my system. The front panel bypass switch makes the improvement in sound-stage size and three-dimensionality very obvious. I had never thought that flat room response and phase (time) response would make such a tremendous improvement in musical detail and clarity. I now can appreciate why you spent so much time on designing the crossovers in your MicroMonitors to have the idealized flat phase response curve. It sure makes the sonics in my music and movies more realistic than any playback system that I’ve ever heard before. The Audyssey EQ really allows the movie sounds of planes and helicopters to sound like they really are flying overhead. Once you and David performed the Audyssey PRO set-up procedure, my system has never sounded better. It has eliminated room-acoustics sound-coloring problems that I had not been able to solve with standard analog equalizers. I understand that the Audyssey EQ solves these room problems by adjusting phase characteristics as well as frequency response at 1,024 different points per channel. This is something, I’ve read, that no other processor in the world is capable of correcting. This has completely eliminated the room’s boominess and muddiness. No longer am I plagued with “dirty” sound. The result is sound with GREAT DETAIL. Remember those old black vinyl LPs with hard-to-understand lyrics? Now I can clearly understand the lyrics and easily discern the distinct voices of the backup singers. This I never thought possible, but it is, from your truly well engineered and carefully crafted speakers. I really love that Grado Reference Sonata [phono cartridge]. I can not ignore the picture quality that you provided. You provided what I believe is the finest image quality I have yet seen via the top-of-the-line DENON Blu-ray player and the JVC PRO D-ILA projector along with an outstanding drop-down 92” fixed-screen mounted in a special custom-designed and built hide-away top mounted housing. Movies now have that film-like appearance with gorgeous deep colors and the deepest blacks I’ve seen. The picture and sound quality are truly superior. Over the years that I have been purchasing equipment from THE SPEAKER FACTORY, you have always answered all my questions and given me the information that I have desired and needed to make intelligent purchases. The fact that I live north of Nashville, Tennessee has not been an obstacle in dealing with you or your company. I chose to have THE SPEAKER FACTORY design and install the system in my home because I had not been able to find any company in my area that I felt understood what I wanted in a music/movie system that would not compromise either sound or video performance and quality. You did that for me. My advice to anyone who wants the absolute best in audio/video would be to contact THE SPEAKER FACTORY for custom-designed and crafted speaker systems and other high grade equipment. I really liked the system binder you left. The systems performance and my enjoyment has truly been “worth the wait”. Thank you Ray for a superb “Home Theater System”. You are THE BEST.